When the new REI store opened in Tysons we were disappointed that there was no bike parking available. We were told that it would be installed real soon now. On a recent visit a FABB member noted that there is now bike parking at the store. The bad news is that the rack is a "wave" rack, which is discouraged by most jurisdictions, including Arlington Co. and DC. See the image on the right from the DC Bike Parking Design document. A photo of the REI rack is below on the right showing how most people end up using the rack. The rack is supposed to hold 5 bikes but in effect usually holds 2 at the most. We've written to REI asking that they use inverted U racks in the future at their stores. Fairfax County does not have bike parking guidelines. There are guidelines in draft form and we've been told they should be implemented soon. 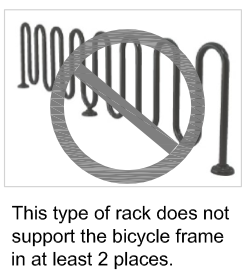 Bike parking is a very important component of bicycle infrastructure and all too often either the incorrect rack is used or a good rack is installed incorrectly. An example of an incorrectly installed rack is one of the new bike racks at the Spring Hill Metrorail station in Tysons. U-racks were used, but the nearest rack in the photo is installed too close to the concrete structure to the left so that there isn't enough room to properly park a bike. We've pointed out this problem and hope it's fixed soon. 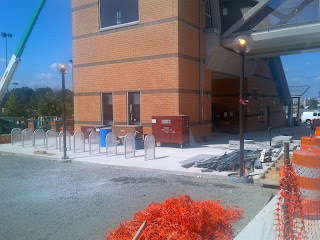 In my experience WMATA has gotten much better about bike parking recently and the Spring Hill example is the exception. The Northern Virginia Regional Park Authority (NVRPA) owns and manages the W&OD Trail. Because Fairfax has so few good bicycle facilities, cyclists are drawn to the trail. As the trail gets more crowded, safety concerns have increased. Trail safety was one of the topics discussed at the most recent NVRPA Board meeting. After that meeting, it was announced that NVRPA will be convening a working group to develop safety recommendations. As you are well aware, over the last year there has been an increased focus on safety-related issues on the W&OD Trail. A new law was passed in Richmond [Section D] that will allow local governments to enact ordinances related to the stop signs on the trail, and there has been an uptick in local law enforcement attention to the issue of safe crossing of intersections. With goals of enhancing safety and promoting communication and understanding among the cycling community, law enforcement and local transportation planners, NVRPA will be facilitating a working group (AKA task force or advisory committee) with representatives from these interest groups to work on the subject of safety on the W&OD and to develop recommendations. We will be bringing in professional facilitators with experience in conflict resolution to help engineer a productive process. Please do not volunteer for this group just yet, since we want to start by selecting a facilitator and then working with them on the structure, process and size of the group. Our goal would be to have this group begin meeting sometime this winter. Our hope is that this process will result in enhanced safety on the trail and better understanding among the parties. There has been extensive discussion about the STOP signs on the W&OD Trail. A recent Virginia Attorney General opinion stated that "It is my opinion that law enforcement officers may enforce against trail users stop signs installed on the W&OD Trail if such signs represent a rule or regulation of the NVRPA." We have written about this issue extensively in the past. We're glad that we may have an opportunity to discuss this and many related issues in the working group. Fourteen bike sharing stations opened in Montgomery County on Friday. This is the first major suburban expansion of bike sharing and we'll be watching it closely. Fairfax County recently received funding to implement bike sharing in Reston and both implementations will face many of the same challenges. County officials and biking advocates hope that the new network — a planned 51 Bikeshare stations and 450 bikes across Silver Spring, Bethesda, Takoma Park, Rockville and Shady Grove — will be a small but significant step toward a less auto-centric community. “These little red bikes are a great symbol of change,” said County Council member Hans Riemer (D-At Large), one of a dozen local and state officials who spoke at the ceremonial ribbon cutting for a station with 15 bikes at the corner of Maryland and Montgomery avenues, among the first 14 sites activated Friday. Montgomery, the first local government in Maryland to adopt Capital Bikeshare, joins the District, Arlington County and Alexandria in trying to reshape the way residents travel. The short-term rental system allows bikes to be picked up in one location and returned to another. Trips under 30 minutes are included in the membership fee, which ranges from $7 for 24 hours to $75 for a year. 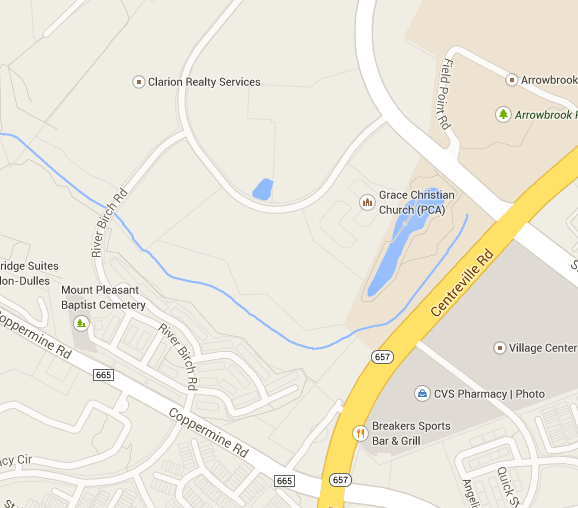 Major repairs to the Fairfax County Parkway Trail will finally be made this Fall. Mike Tessitore of VDOT attended the FABB meeting this month to discuss details of the project. There will be two phases, from Route 7 to Alliance Dr (near VDOT HQ) and from Alliance Dr south to Rolling Rd. Portions of the segments needing to be repaved are in the Fairfax Co right-of-way so the county needs to fund those sections. VDOT has committed to funding repairs in their right-of-way and they are hoping to reach agreement with the county on their sections. Unfortunately the many dangerous crossings of the exit/entrance ramps will not be included in this project. Those will require additional funds and engineering design work. Here's the briefing presented at the meeting, Fairfax County Parkway Trail and ADA Ramp Repair Project. I noticed bike racks at the new 'Greensboro' Silver Line station (used to be called 'Tysons Central 7') for the first time today so I took a few pictures. Also took a detour to check out what had been done at the 'Spring Hill' Station (used to be called 'Tysons West'). In summary, there are 10 inverted U racks on the north and south side of each station, with the exception of the south side of the 'Spring Hill' station . There were only 4 at that location. Its possible they plan to put in more. So current count looks like a max of 40 bikes at Greensboro and a max of 28 at Spring Hill. If anyone is interested, I also took some pictures of the sidewalks on either side of Route 7. Work is still on-going, but in general they are doing a decent job of widening the sidewalks on both sides. 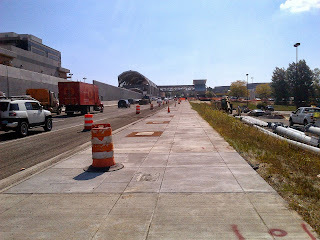 Unfortunately the sidewalks COMPLETELY stop as you walk east past the Greensboro Station. Any Silver Line rider that exits the Greensboro Station and needs to go east (to the other side of Rt 123) is out of luck. Despite the wide sidewalks the Rt 7 corridor is a VERY difficult place for pedestrians. Street crossings are poor, if present at all. But work is still underway, so hopefully some of these issues will be addressed. VDOT is considering a road diet on River Birch Road. The road is just west of Centreville Rd and just south of the Dulles Toll Road. It extends from Sunrise Valley Dr to Dulles Technology Dr. The road currently has four lanes with very low traffic volume. Bike lanes would be created as part of the project. VDOT and Fairfax County Supervisor Foust have heard concerns from the community surrounding River Birch Road: there is too much speeding traffic, and there is not enough parking. VDOT is considering ways to change the pavement markings to help address these concerns and wants the community’s input before taking any action. In particular, River Birch is currently striped with two lanes in each direction, but the amount of traffic is so low that it would easily fit in one lane. Taking a lane away would make room for other uses of the pavement, such as on-street parking and bike lanes. Public input is essential in deciding if and how to reconfigure the street, so please consider attending to let VDOT know your views. Wednesday, October 2, 2013, 7:00 p.m. In 2004 the Virginia Department of Transportation adopted a policy to routinely accommodate pedestrians and bicyclists in all road construction and reconstruction projects. More than 500 other state and local governments as well as regional planning organizations have adopted similar “Complete Streets” policies. In Fairfax, VDOT’s policy has helped spur welcome changes that incorporate bicycle and pedestrian facilities in the planning and design of road projects. But adopting a policy and implementing one are two different things. A new book by Barbara McCann examines in detail how different communities are tackling the challenges of putting Complete Streets policies into practice. McCann is the founder of the National Complete Streets Coalition and a long-time bicycle advocate in Washington DC and Atlanta. Her book, Completing Our Streets: The Transition to Safe and Inclusive Transportation Networks, will be enlightening reading for anyone interested in creating a more bicycle- and pedestrian-friendly transportation network. Completing Our Streets focuses on the complex, political process by which project projects are chosen, planned and built. State and local transportation departments have accreted decades of rules and practices that tend to prioritize travel by motor vehicles. Federal funding streams flow predominantly toward projects focused on cars. A single new policy, by itself, will change very little in how business is done. Successful advocates have used Complete Streets policies as a wedge to get in the backrooms where many transportation decisions are made and to influence elected officials to put their weight behind a more multi-modal approach. McCann explains that the Complete Streets movement is not about street design. Instead, practitioners and activists have changed the way projects are built by focusing on three strategies: reframe the conversation; build a broad base of political support; and provide a clear path to a multi-modal process. McCann shares stories of practitioners in cities and towns from Charlotte, North Carolina to Colorado Springs, Colorado who have embraced these strategies to effect fundamental change. Completing Our Streets: The Transition to Safe and Inclusive Transportation Networks will be published by Island Press on October 14. Parts of the book are being excerpted on Smart Growth America’s website. In Fairfax, FABB has seen how successful we can be when advocates are fully engaged in the many different facets of transportation planning. In Tysons, FABB volunteers have participated in all of the major processes that have gone into redeveloping Fairfax’s new “downtown” around transit – processes that have been unfolding for longer than FABB has existed. FABB mobilized when original plans for new bridges over the Beltway HOT lanes excluded bicyclists and pedestrians, leading to significant improvements. These can be very drawn-out processes with twists and turns and setbacks, but patience and persistence pay off. Join us at the Fairfax Bike Summit on November 2 to learn more about how each of us can make change happen. On Saturday morning we will be part of a walking tour of Tysons focused on the area around the Spring Hill Metrorail Station sponsored by the Coalition for Smarter Growth. We'll be discussing the importance of bicycling to the future of Tysons, which is the theme of the Fairfax Bike Summit on November 2. The Tysons Bicycle Master Plan outlines a vision for transforming Tysons from an auto-dependent office park community into a vibrant, mixed-use, transit-oriented community where bicycling is an integral part of the transportation network. Tysons is a large place and bicycling is one option for traveling to and from the new Metrorail stations. All of the stations will have bicycle parking and none will have permanent auto parking. From the west: turn L on Clarks Crossing Rd to L on Beulah Rd. Continue straight at stop sign to Trap Rd. At the next stop sign turn R on Gelding Lane then a quick L on Bois Ave. Follow Bois around to L on Montmorency Dr. Take Montmorency to the very end where there is a paved trail. Take the trail then turn L on the paved road/trail that leads into Tyson. Follow this trail to a gate. Go around the gate to Northern Neck Dr. Turn R on Ashgrove House Lane and continue on Ashgrove Lane to R on Sheraton Tysons Blvd to L on Westwood Center Dr. Turn R on the Route 7 sidewalk to the station. From the south & east: In Vienna turn R on Church St and go 2 blocks to L on Park St then R on Ayr Hill Ave. Continue to the end and L on East St, R on Creek Crossing Rd, R on Fairway Dr. Continue to L on Old Courthouse Rd, R on Pine Valley Dr, then L on Higdon Dr. Continue to Palm Springs Dr to the end where you will see a paved trail on the left leading to a R on the paved trail/road that leads into Tyson. Follow this trail to a gate. Go around the gate to Northern Neck Dr. Turn R on Ashgrove House Lane and continue on Ashgrove Lane to R on Sheraton Tysons Blvd to L on Westwood Center Dr. Turn R on the Route 7 sidewalk to the station. From the north: There are few good routes from the McLean area and points north. You could use Old Dominion Dr to Old Cedar Rd. Toward the end of the road there is a paved trail into Bull Neck Stream Valley Park. Follow the trail to Spring Hill Rec Center and L on Spring Hill Rd. Continue under the Toll Road to R on Spring Hill Rd. Continue across Route 7 to the station. At our September meeting we will hear from Michael Tessitore of VDOT about plans to repave major sections of the Fairfax County Parkway Trail. Last February FABB volunteers conducted an assessment of trail conditions that included identifying major damage to the trail, with photos and GPS points. That information was used by VDOT to conduct their own assessment. Funds are now available for this effort. Another guest, Rich Tepel of the Potomac Pedalers Touring Club, will give us an overview of the club and its activities. Charlie Strunk, county bike coordinator, will give us an update on county bike projects and activities. We'll also discuss planning efforts for the Fairfax Bike Summit on Nov. 2. The FABB meeting is held at Patrick Henry Library in Vienna starting at 7:30pm and runs until 9pm. All are welcome to attend. With nearly $220 million in new local funding available after passage of HB 2313, Fairfax County is identifying projects to be built over the next 7 years. At the Board of Supervisors Transportation Committee meeting today, DOT chief Tom Biesiadny presented a list of roadway, transit, and bike and pedestrian projects to the Board. Old Keene Mill Bike Shoulders. While these projects are definitely needed, there are many, many more projects that should be on this list. Are these the 11 most important [unfunded] bicycle projects in the county? We don't think so. See the list of projects developed from the Bicycle Master Plan process or the Top 14 project list compiled by FABB in 2009. We hope to get more information about the lists from the county bike coordinator at our meeting tomorrow. We need to ensure that a comprehensive, prioritized list of bicycle projects is funded with these new transportation dollars. Update 18Sep2013 - The above list of projects are the UNFUNDED projects. Tom also released a list of funded projects that includes several important bicycle projects including 10-foot trails along Route 7 when it is widened, Burke Road Bike Lanes, Old Courthouse Road bike shoulders at Freedom Hill Park, bike lanes on Idylwood Road, the Vesper Trail into Tysons, improvements to the Ashgrove Trail, the Mason Neck Trail, Lorton Road bike lanes, and several projects in Tysons including the grid of streets, pavement markings and wayfinding signage throughout Tysons, and new crossings of the Beltway. Today Fairfax County bicycle coordinator Charlie Strunk briefed the Board of Supervisors on the DRAFT Bicycle Master Plan. He gave an overview of the process to date, a summary of key recommendations, and a timeline for adoption of the plan. The plan was completed over a year ago and it's good to see that a schedule is in place for getting the plan approved. Below are some of the key slides from the presentation. We're counting on the Board devoting the resources needed to implement these recommendations. Examine innovative bicvcle design treatments (e.g. cycle-tracks, buffered bike lanes, climbing lanes, striped shoulders) on an additional 94 miles of roadway. 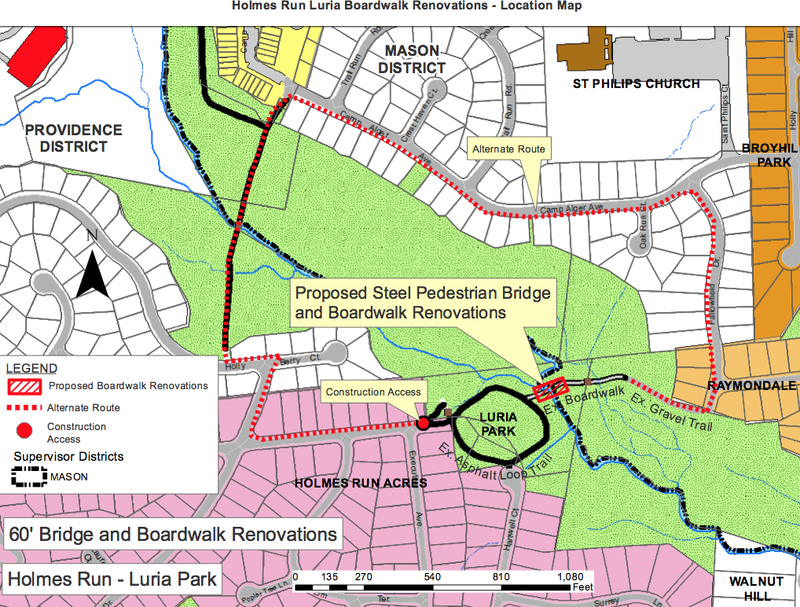 Examine new pedestrian and bicvcle crossings of the beltway and other maior barriers. Expand connectivity to activity centers and rail stations by expanding access to/from the W&OD trail, the Cross County Trail (CCT), Holmes Run, Rocky Run, South Run, and the Pohick Stream Valley. The meeting today was an important milestone. Even though Charlie's presentation was last on the agenda and the briefing lasted only 10 minutes, the Board now has a definite timeline for adoption of the plan. Charlie laid out an important list of implementation steps that if completed, will have the potential to transform the county into a bicycle-friendly community. It is now up to FABB and cyclists around the county to build support for the plan, and most importantly, advocate for a fully funded bicycle program. Sebastian, who is helping coordinate for the first time all of the District’s master transit plans as part of the moveDC project,became the District’s bike program coordinator in 2001 and helped bring bike share to the city, first with a pilot program called SmartBike D.C. in 2008, then partnering with Arlington County to launch the Capital Bikeshare system in 2010. Under Sebastian’s watch, the District has added more than 50 miles of bike lanes and 2,500 bike racks, and has more than doubled the number of people on the streets biking. But he’s not done yet. In addition to overseeing the growth of Bikeshare, which is managed by the company Alta, he’s also partnering with DDOT to complete the 20-mile Anacostia Riverwalk Trail, now 60 percent done, and the M Street cycle-track. Right now, bikes represent 3.3 percent of total commutes, Sebastian says. But he expects it to hit 5 percent by 2015. Bike advocates such as Sebastian and the Washington Area Bicyclist Association also insist commuting isn’t their sole focus. Short trips to the grocery or library, or a recreational ride along the water, are the sorts of things they say that Bikeshare can facilitate better than Metro and buses. Indeed, a 2013 member survey showed that seven in 10 users had used Bikeshare for social activities or to run errands. WABA has been around since 1972, long before bike sharing captured the imagination of city planners. The organization helped lobby for bikes to be allowed on Metro during non-rush hours and to close Beach Drive to car traffic on the weekends. Now it’s offering adult biking lessons and safety instruction while continuing to lobby for more bike lanes and infrastructure. Today at about 5:15pm a cyclist was riding through the crosswalk at Maple Ave and the W&OD Trail when a motorist ran the red light and struck the cyclist. He was thrown forward. He was able to get up and walk but he may have internal injuries. The Vienna EMS people arrived shortly after being called and Vienna police (Officer Mangan) arrived shortly after that. The motorist had New York tags. The cyclist was taken to Arlington Hospital. The photo on the right shows the cyclist sitting on a planter near the intersection. He said this was his second crash in a month, having been struck in Arlington by a motorist who turned into him. We'll see if we can find out more information about how the cyclist is doing. The motorist was being issued a ticket as we were leaving. When we called 911 and reported our location the dispatcher wanted to know the nearest intersection. I had just told her the crash occurred at the W&OD Trail and Maple Ave intersection. She wanted the next street intersection. We've suspected that police do not know how to identify W&OD trail/road intersections, so crashes are often reported for the nearest road intersection. An example is the W&OD Trail/Wiehle Ave intersection, the site of several crashes. The nearest intersection is Wiehle/Sunset Hills, which at one time was the location of the most bike crashes in the county. We suspect many of those crashes occurred at the W&OD Trail intersection but were not logged property. We'll check with Fairfax County police on how they treat the Trail intersections. Update 9/14/2013 - We called Virginia Hospital Center (Arlington Hospital) and learned that the cyclist involved in the crash was released from the hospital yesterday, but they had not information about his condition. 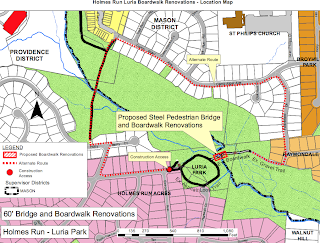 The boardwalk in Holmes Run Stream Valley Park near Luria Park, connecting Holmes Run Dr with Fallowfield Dr/Brad St, will soon be repaired by the Fairfax County Parkway Authority. This is a popular connection for bicyclists in the Annandale area, located south of Route 50 and east of Gallows Road. The Park Authority will close the trail during construction. Work will begin this month and is projected to last until the end of 2013. A detour is identified on a map (right) posted at the trail, but we've asked for additional signage to guide cyclists through the detour, especially when the project begins. It can be difficult to look at a map and remember a route after seeing it for the first time. Detour signs should be placed at each decision point/intersection. The detour includes two flights of stairs. While there is a ramp that can be used for rolling the bike while climbing the stairs, we've asked if anything can be done to make the trip more feasible, especially for someone who would have a difficult time hauling their bike up the ramp. If you know more about this project, please leave a comment. FABB volunteers were out counting bicyclists today at 7 locations around the county as part of the National Bicycle and Pedestrian Documentation Project. We often say that based on our casual observations, we're seeing more cyclists in Fairfax, but we need some concrete data to prove that assertion. 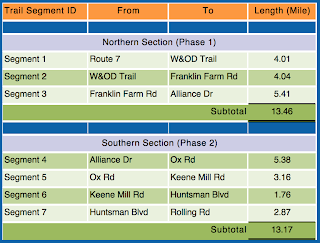 W&OD Trail counts - It's surprising that there are no automated counters on the W&OD Trail in Fairfax County. Arlington County has several. The trail is the most popular bicycle facility in the county and we'd like to show that usage is increasing. Chain Bridge/Westmoreland Dr - Bike lanes were striped on Westmoreland a few years back and we want to track usage over the years. George Mason Blvd/University Blvd - We'd like to know if bike use is increasing at Mason. They are a Bicycle Friendly University and have added bike lanes and good bike parking over the past several years. Students are currently in session. The spring count period recommended by the documentation project often doesn't work for Mason because students are usually on break. 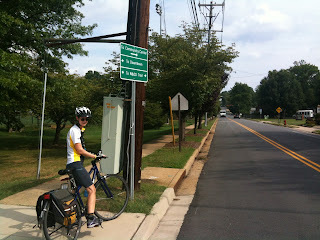 Sunrise Valley Dr - With the coming of Metrorail to Reston, we expect bicycle usage to increase. We want to get some counts before rail comes to see if there is an increase afterwards. We also want to count on Soapstone Dr because bike lanes were installed there a couple of years ago. We hope to have some summary data together in a week or so. The DC chapter of the Urban Land Institute recently surveyed their members on their attitudes toward walking and biking. According to the Post article Real estate survey shows broad support for biking and walking commutes, "Almost everyone — 96 percent — said the region would be better off if more people walked or rode bicycles to work, and 86 percent said they expect that trend to grow significantly in coming years." People are driving less, especially young people, and they want to live in walkable, bikeable communities. This survey of real estate professionals shows that they get it; building places where we can safely bike and walk for short trips is popular and economically successful. The survey also noted that local governments are not doing enough to support this trend. Only about half of survey respondents — 49 percent — said local governments were doing enough to support biking and walking, and only 20 percent said employers were doing enough. Among the most popular suggestions for improvement were more bike lanes, sidewalks and trails (49 percent); increased public and private funding (22 percent); employer-based incentive programs (10 percent); and more legislation and enforcement of drive, pedestrian and biker rules (9 percent). Rother said she expects to see owners and managers of office buildings in urban areas begin to offer more incentives for bike commuters, including private bike rentals for employees and bike repair stations. While we are marking some progress in Fairfax with dedicated funds for bike and ped improvements near the new Silver Line Metrorail stations, progress is much too slow. The Tysons Bicycle Master Plan was completed over two years ago and has still not been adopted by the Board of Supervisors. The same is true of the Countywide Bicycle Master Plan that was completed over a year ago. The Board of Supervisors needs to fund the bicycle program, increase the number of staff devoted to bicycling, and increase funding, and priority of bicycle infrastructure projects, or Fairfax will not be able to compete with places like Arlington, Alexandria, and the District. According to the Post article Bike thefts on the rise in Fairfax County, bike thefts in Fairfax County rose 36% this year over last. It was a surprise to me that the McLean area was hit hard with 86 bikes stolen. It's best to always lock your bike, even if you're stopped for just a short while. According to authorities, 361 bicycles were reported stolen in the county between Sept. 1 2012 and Aug. 31, 2013 — an increase of about 36 percent over the previous year, when roughly 265 thefts were reported. The McLean area, police said, appears to have taken a significant hit, with 86 bikes reported stolen. Many of the bikes were taken when residents left their garage doors open. “Thieves simply seize the opportunity, take the bikes, and walk away,” police said in a news release. Bike thefts in Arlington County are also on the rise, reaching an all-time high this year, police reported in August. • Keep garage doors closed, and don’t leave bikes outside for extended periods of time. “Thieves may be watching and may target ‘unused’ bikes,” police said. • Invest in a hardened steel U-lock. • Consider installing motion sensor lights or alarms on your property. • Take a photo of your bike and record the serial number. • Register your bicycle on the National Bike Registry. •Report the stolen item online. Dan Reed of Greater Greater Washington looks at the need to provide good biking and walking routes to Metrorail stations. He writes about a Metro study of distances people travel to Metro parking facilities. Many of the motorists at Metro parking lots live within a mile of the station. Given good bike and ped routes, most of those people could bike to the station and many could walk. In 2010 FABB's Tom Wyland wrote about a similar study done by Fairfax County, Travel patterns to the Herndon-Monroe Park and Ride lot. A top goal of FABB is to ensure that residents have safe, convenient bicycle access to the Silver Line stations in Tysons and Reston. Current conditions at the Tysons stations are not good. All four stations are adjacent to major arterial roads (Routes 7 & 123). Other than the bike lanes on the Gallows Road leading into Tysons, there are no dedicated bike facilities in Tysons. 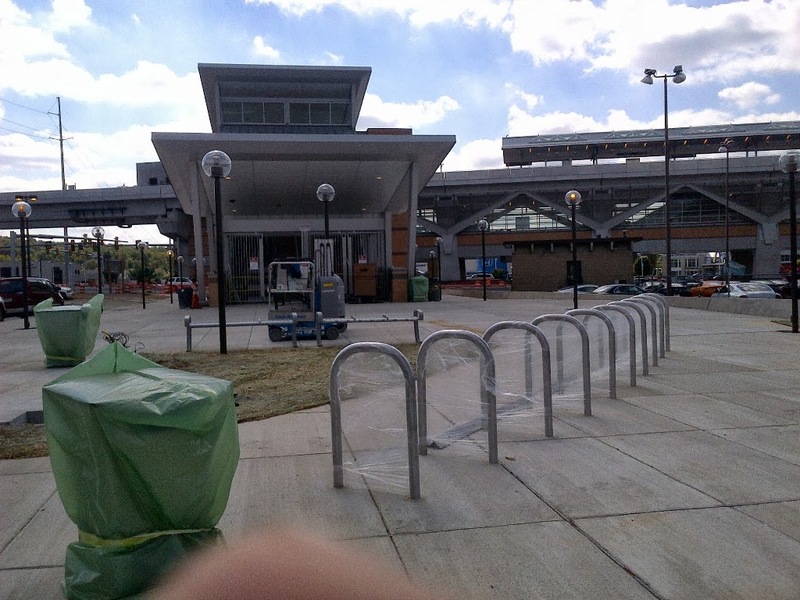 While some of the Phase 1 Tysons Bicycle Master Plan facilities have been built, most have not. Bike access to the Wiehle Ave station in Reston is better, but some of the more important planned improvements will not be made until 2017 or later. 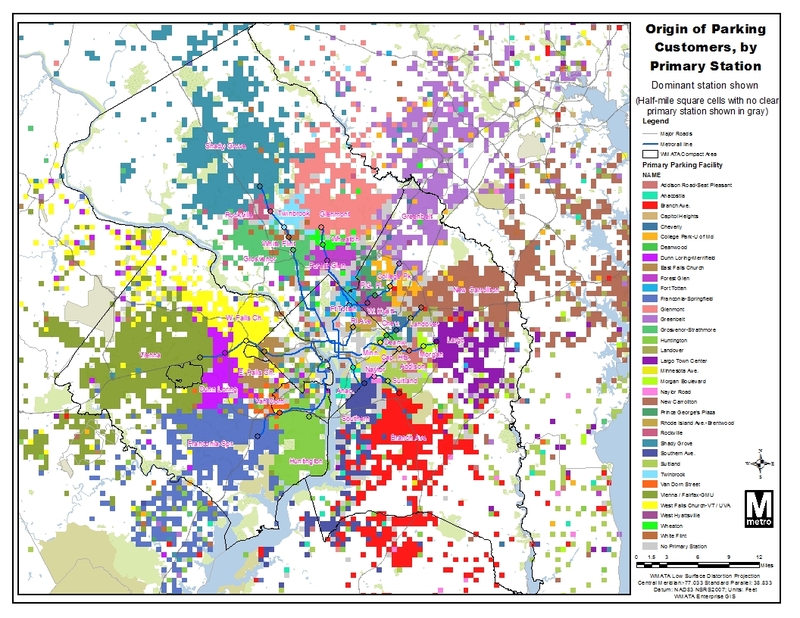 On the PlanItMetro blog, system planners studied how people use each of the 35 stations where Metro operates parking lots or garages and where they come from. They found that people drive from as far as Baltimore, Annapolis and Manassas to use Metro's 9 terminal stations, which have lots of parking and are some of the system's busiest. Meanwhile, 26 other stations serve "neighborhood parking" needs, attracting commuters who drive very short distances. Two-thirds of drivers at Forest Glen station come from within two miles, while 30% of drivers at Van Dorn Street, West Hyattsville and Fort Totten come from within one mile. These commuters could walk or bike instead, but many of these stations are located in a way that makes doing so hard, if not impossible. Fort Totten is in the middle of a park, and while surrounding neighborhoods are fairly dense, there are very few street connections to them. West Hyattsville is surrounded by vacant lots. 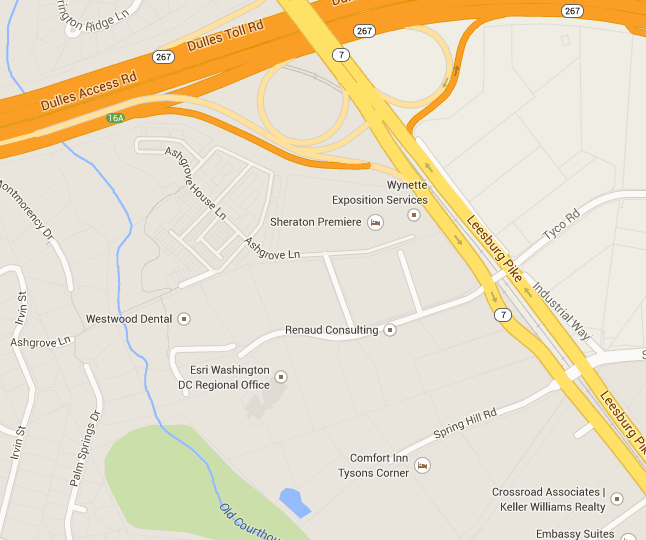 Van Dorn Street is hemmed in by rail yards, busy roads and the Beltway. Forest Glen actually has decent street connections, but people living south of the station have to cross the Beltway on a dark, dangerous pedestrian bridge. As a result, people living near these stations feel like they have to drive there. This means more car traffic and more pollution, since cars produce the most emissions withinthe first few minutes of operation. But poor pedestrian and bike access also restricts the capacity of a station to how many parking spaces it has. If those spaces are filled by the morning rush hour, that station is effectively closed to new riders until the evening. That might explain why stations like Forest Glen and West Hyattsville have some of the system's lowest ridership. Some excellent speakers have agreed to participate in the 2013 Fairfax Bike Summit. Jeff Olson of Alta Planning & Design and author of The Third Mode: Towards a Green Society will be our keynote speaker. Other speakers include Andy Clarke, President of the League of American Bicyclists and author of Smart Cycling: Promoting Safety, Fun, Fitness, and the Environment, Bill Nesper who directs the Bicycle Friendly America program at the League of American Bicyclists, and representatives from WABA, WMATA, Fairfax County DOT, VDOT, and several other organizations/companies. Registration is now available. The summit will focus on "Tysons: A Bicycle-Friendly Community" and the need to make all future transit-oriented, mixed-use developments in Fairfax bike-friendly, especially since future development in the county will be primarily concentrated around transit. Tysons has the potential to be a very bicycle-friendly place when the Tysons Bicycle Master plan, which FABB helped produce, is implemented. The summit will be held at George Mason University on Saturday, November 2, and is open to everyone from interested citizens to community leaders. The registration fee is $25, which includes lunch. For more information see www.fabb-bikes.org/summit. The summit is organized by Fairfax Advocates for Better Bicycling, in partnership with George Mason University, Fairfax County, and the City of Fairfax. If you are interested in volunteering or exhibiting at the summit, contact us at bikesummit@fabb-bikes.org. Hope to see you there! Keeping track on the Mount Vernon Trail is the print title of a good article in today's Post. The online title sums up the gist of the article: Tracking the trail: Sensors on Mount Vernon path collect data to aid transportation planning. The most recent counters are part of Arlington County's Bike Pedestrian Automatic Count program. Arlington ensured funding for the program by increasing their vehicle decal fee from $25 to $33 which provides $1.151 for Complete Streets, bike counting, wayfinding signage, and Capital Bikeshare stations. Fairfax County could do the same with their vehicle registration fees. John Pickett, a federal economist, mounts the 20-year-old red touring bike that he’s dubbed “the Mule” just before 7 a.m. outside the shed behind his home in the Mount Vernon area of Fairfax County. Over the past decades, he’s put more than 33,000 miles on its odometer, and he’s ready to add 15 more. As the rising sun breaks over the Potomac River, Pickett pedals northward along the Mount Vernon Trail. He is one of the Washington area’s growing number of bicycle commuters, and he’s due at work in Rosslyn in about an hour. Getting into his rhythm near Dyke Marsh, the 57-year-old Pickett barely notices passing a brown wooden post. He has no sense of breaking a light beam, but this is where the National Park Service first detects — and counts — him. It happens over and over again to Pickett and the approximately 2,000 others who use the trail each day. As they bike, run and walk the 18.1-mile path, they unknowingly trip a series of sensors. Those dozen sensors are connected to counters, which over time will tell a tale of who is using the route and at what times. In the traffic-snarled capital region, where transportation alternatives are becoming increasingly important, this bike and pedestrian route and others like it across Northern Virginia, Maryland and the District have become “a secondary nervous system” for commuters. Bike-friendly Arlington County, which works closely with the National Park Service, has placed the newest sensor, an expensive, state-of-the-art, French-made device, on the trail near Reagan National Airport. Unlike older counters, this one can distinguish between humans and machines, using an induction loop embedded in a double-diamond pattern in the pavement. It senses when a bicycle passes over. That is paired with a passive infrared sensor that notices the direction of travel when a warm body passes by, creating a disturbance much like a boat’s bow wave. That minute-by-minute information is wirelessly uploaded each quarter-hour to a central database and sent to the county daily. While pedestrians and bicyclists share the trail, reports show that two-thirds of the users are on two wheels. No one knows how many are commuter, but bright red Capital Bikeshare bikes are popping up with regularity. That rent-by-the-hour bike program started with 100 stations in the District and 14 in Arlington in 2010. It now has more shared bikes in circulation — 1,890 — than any other region in the country, having just flown by the 4 million trip mark, with 22,000 members and expanded networks in the District, Arlington, Alexandria and, soon, Montgomery County. Bike commuting in Arlington has more than doubled between 2006 and 2011, and the D.C. Department of Transportation estimates an average of 87,000 bike trips per day in the region. 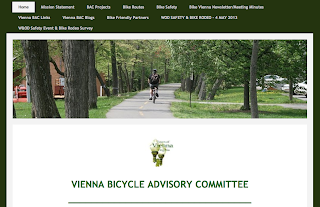 At their June 17 meeting the Vienna Town Council disbanded the Vienna Bicycle Advisory Committee. According to the Sun Gazette, the council "agreed to disband the Vienna Transportation Safety Commission’s (TSC) bicycle advisory committee and a soon-to-be-formed pedestrian committee, saying their functions would overlap." While there is some overlap between a bicycle and pedestrian advisory committee, bicycle facilities are often very different than pedestrian facilities. In a town like Vienna with many urban sidewalks and few sidepaths, cyclists generally ride on the road, with the major exception of the W&OD Trail. As former chairman of the county Trails and Sidewalks Committee, it's been my experience that combining the two interest groups does not work well. It's difficult for pedestrians, who may not even ride a bicycle, to make decisions that affect cyclists. The committee is to be commended for developing a number of bicycle routes in the town. They promoted bicycle safety with bike rodeos and safety events, and they did great work getting good bike parking in some of the shopping centers. We're hoping that the bicycle advisory committee is reinstated soon. Despite not having a BAC, the other day we noticed new wayfinding signs in Vienna. The photo on the right shows the one sign that we noticed at Center St and Locust St where one of the designated routes starts. It points to the Community Center, Downtown, and the W&OD Trail. To be effective, there needs to be a dense network of route signs leading cyclists to major destinations. The sign in the photo is the only one that we saw. It's a good start and we assume many more signs are coming. Approximately 80 signs were recently placed in McLean that cyclists can use to navigate that town.